15,000-20,000 rallied across the province while about 6,000 marched on BC legislature in Victoria to support BC teachers and stand up for BC. 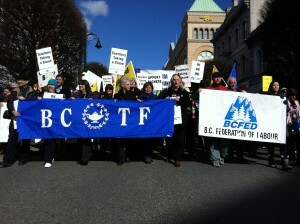 The BC Federation of Labour organized the rally and with short notice the BCTF and peer unions in the BCFed summoned the show of force. Parents and their children showed up by the thousands at today’s rally. The halls of legislature shook, with the government nervously hearing BIll 22 while thousands joined in unison to drown out the oppressive measures, including outrageous fines for doing exactly what the BCTF and its widespread public support was doing. “Shame” on the BC Liberals the crowd chanted as speaker after speaker described the debilitating conditions under which the teachers and the BCTF are now placed.